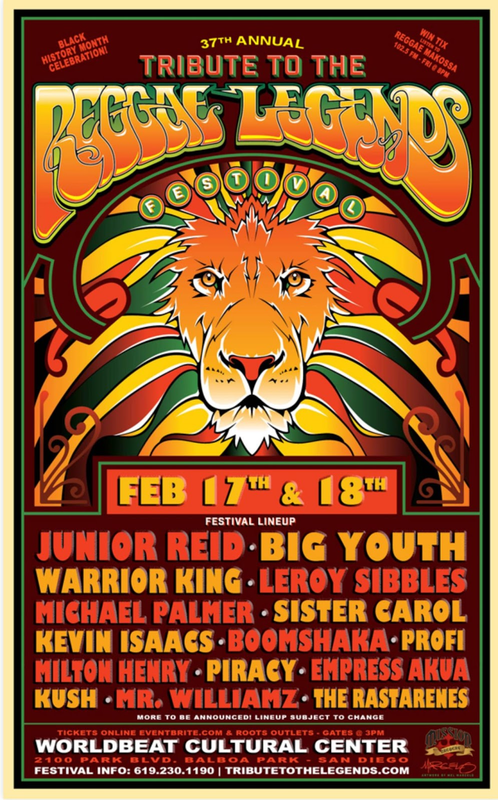 Tribute to the Reggae Legends Festival, formerly known as Bob Marley Day, has been an annual event in San Diego for 37 years now. 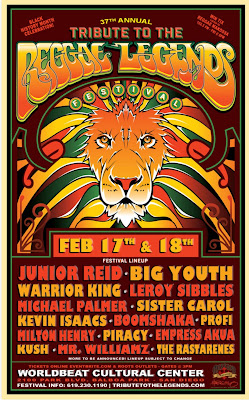 The Annual Festival is one of Southern California’s largest Reggae events. WorldBeat Productions has been the spearhead for bringing Reggae Music to San Diego with artists like Peter Tosh, Dennis Brown, Gregory Isaacs, Bunny Wailer, Mikey Dread, Black Uhuru, Steel Pulse, Burning Spear, Lucky Dube, Jimmy Cliff and the brightest stars from Africa, Latin America, Europe and Asia. Festival Founder Makeda Dread was a personal friend of Bob Marley and after he passed in 1981, Makeda created a tribute to Bob Marley Festival. The first Bob Marley Day was held at the International Blend on 30th Street and then moved the following years to the Jackie Robinson YMCA, Carpenters Hall, North Park Theatre and Adams Ave. Theatre. Over the years, the event’s popularity increased and so WorldBeat Productions teamed up with Moss Jacobs, who brought his expertise and professionalism to bring the event to large capacity venues such as the San Diego Concourse (Golden Hall) and California Theatre. After reaching its capacity in these venues it was time to bring the team's hugely successful Bob Marley Day festival to the San Diego Sports Arena. After consistently selling out capacity shows for over 10 years, Bob Marley Day transformed into what it is now known as, Tribute to the Reggae Legends, in honor of all the great reggae artists that have passed throughout the years. Support WorldBeat Center and My Chosen Vessel by purchasing your tickets on Giving Tuesday, November 28th. $5 of each ticket sold on Giving Tuesday will support My Chosen Vessel's Sustainable Clean Water Program for the Maasai in Kenya. In addition, a percentage will also go to support WorldBeat Cultural Center's free programming. Please support WorldBeat Center's efforts in creating a global community through music, art, dance, and culture.